I was in Austin when the World Trade Center got attacked by the terrorists. It was quite a shock to the American society, but since we were far away, life got on. The only immediate inconveniences were that a shopping center was closed for a day, and we had to cancel our trip to Toronto as most of the flights were canceled. Thanks to the good customer service we got 100% refund from American Airlines. On 2001, the US economy was in crisis and our company implemented force vacation for its employees. I was on a different work program so it didn't concern me. Still, I decided to take some days off to visit New York. 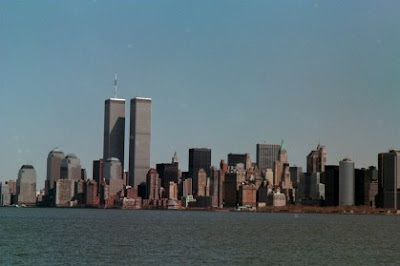 That was back in April 2001 so the World Trade Centers were still there. Never would I think that these towers will disappear on my second visit. The World Trade Center in April 2001. I went back to New York with hubby in December 2002 for Christmas vacation. It was emotional to go back to the same place and those Towers had disappeared. We passed by a fence where people from all over the world put on some words in different languages, praying for those sacrificed in the 911 attacks. New York City without World Trade Center, photo taken on December 2002. Hopefully we could make another trip to New York when the rebuilding and foundations works have completed. I still remember where I was when 9/11 happenned. I was waiting for The West Wing to come on when TV3 flashed 'Berita Tergempar'. That was about 10.30pm Malaysian time. And then I watched the whole horrifying incident live in my living room. May the souls of those who perished in the 9/11 incident rest in peace. It is all over now!